Last night, Food News writer Pam Denney and I went to the soft opening of Stella Marris, Steve Cooper's restaurant that had been the subject of protests by Cordovans who were concerned about Cooper's background in adult entertainment. CMI, the Flyer's parent company, is holding a Jack-o-Lantern contest. 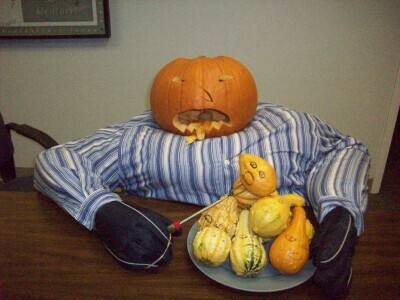 Check out this entry of a pumpkin eating gourds. I always suspected pumpkins were vicious like that! A Visit to Wayne's Candy Co. When I stopped by Wayne's Candy Co. earlier today, co-owner Kelly Hardcastle was standing in the door. Check out that smile! He's been selling candy since 6 a.m. this morning. On Friday, the Dixon Gallery & Gardens is hosting the Brewers' Feast, which will highlight the home-brewed creations of Mike Lee, owner of Mid-South Malts, and Dale Skaggs, a long-time home-brewer who is the Dixon's director of horticulture. Skaggs took the time to answer a few questions about beer for Hungry Memphis. You're both a horticulturist and brewer. Where does the twain meet? The fact that all the ingredients in beer are from cultivated plants is a natural convergence of brewing and gardening. Both involve growing living things for our purposes. In brewing, yeast grows in a media of natural sugars; and in gardening, plants grow in a media of soil. Historically, if you look at the beers brewed in medieval times, many more plant-based ingredients were used than only the barley and hops used today. Both gardening and brewing are celebrations of the natural world. I stopped by Mr. Lincoln's Costume Shoppe today to check out the food costumes. You can be an M&M, for example, in any number of colors. She's eaten the black taco, she's competed in the Krystal Square Off, and had her way with Burger King. Good news: After a hiatus, fast-food chronicler Backyard Blogger is back. I like to "feel the burn." But truth be told, I'm not all that into exercise. That's why I've become addicted to the Lebanese pepper paste they make at the Mediterranean International Market on Park Avenue just east of Highland. Today, food news writer Pam Denney and I stopped by the estate sale at the Annesdale-Snowden House. We cleaned the place out. Slashfood.com recently posted about Nick Rogers' film In Queso Fever, which explores Arkansas' special ties to cheese dip and makes the point that the food-stuff isn't that widespread in other parts of the country. I saw this on the Goner Records board and had to share: It's a 9-minute documentary on the old Pat's Pizza on Summer. I affectionately refer to the "Bacon Wrapped Stuffed Shrimp" at Cafe Ole as the "double-flesh combo." It's pretty much the most un-kosher thing a nice Jewish girl could eat, but that hasn't stopped me yet. Yesterday morning I ate something I really shouldn't have eaten. It was a kind of gravy-slathered meal in a bowl. It was layers of perfect biscuit, fluffy eggs, creamy white gravy, and spicy sausage piled in a bowl courtesy of Bryant's on Summer Avenue, where I'd stopped to have pre-flight breakfast with an old friend who'd been visiting for the past week and was leaving for New York at noon. It was my second Bryant's meal of the week, and it was revolting … it was also utterly delicious. My friend, who lived in Memphis for years before moving to the Big City, decided that while he was here he'd throw all gastroenterological caution to the wind and eat his favorite Southern foods three times a day. That means I've also been eating his favorite Southern foods at least twice a day and while I will miss my old pal's company, my arteries were awfully happy to see him finally board that northbound plane. Paul and Angela of From the Southern Table blog about rendering lard from 15 pounds of pig back fat. My reaction is equal parts ew and awe. Plus, the post has given me a great idea for my next blog: pigautopsy.com. In honor of the next weekend's RiverArtsFest, area wine retailers are selling RiverArtsFest wine. This morning I was listening to crazy-pants Glenn Beck, when he launched into a commercial for Food Insurance.